Brother Jesse Blog: Interview with songstress Akilah Nehanda Muhammad: "If you organize your thoughts you can accomplish anything"
Interview with songstress Akilah Nehanda Muhammad: "If you organize your thoughts you can accomplish anything"
Brother Jesse Muhammad (BJ): At what age did you fully realize that you were blessed with a singing voice? 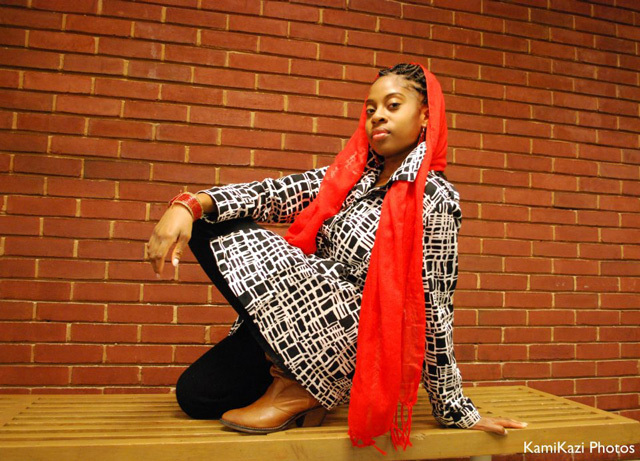 Akilah Nehanda Muhammad (AM): I've been singing since I can remember. However, the earliest video tape I've seen of me singing was for my third birthday. BJ: What has helped you to develop your voice over the years? Have you ever received some form of musical coaching? AM: First, my mother used to sing to me when I was a baby and I could always remember there being music around me. Over the years, just by listening to great artists like Mahalia Jackson, Michael Jackson, Lauryn Hill, Marvin Gaye, Gospel, etc and singing to their music, my voice has developed. I attended the High School for the Performing and Visual Arts in Houston, Texas, for musical theatre and our instructor Mr. Mertz taught us the basics of vocal techniques while we were there all four years as a class. And throughout my childhood my aunt, Allana Muhammad, who is also a recording artist and a classically trained singer, would teach me some things about singing whenever we were around each other. BJ: You're a senior at Howard University set to graduate in 2012. 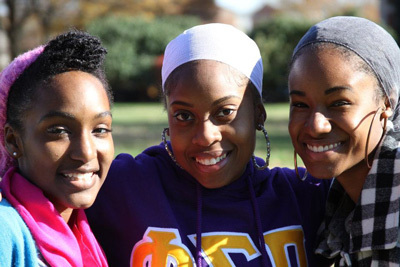 What are you majoring in and what do you plan to do with your degree? AM: I am a film production major with a minor in fashion. I plan to use my directing, editing, and cinematography skills that I've acquired here at Howard to direct and edit my own music videos like I was blessed to do for "Best in the World." I also plan to make films that will have a positive impact on the world and that inspire women to be true to the Queen within. By this I mean, bringing modesty, dignity, and love of self, family, and God back into mainstream through this media outlet. BJ: Let's talk about your first music video you just released "Best in the World." Fans like me can take for granted the behind-the-scenes work it takes to put together a video like that. Tell me about the process it took to get it done. Was it harder than you imagined? Was it a major team effort? AM: There was a lot of spiritual preparation involved during this summer leading up to my recording this song in November. I prayed and read a lot. But once I get started on a project that I'm passionate about I'm the type of person that moves very quickly. I chose the beat online and I wrote the lyrics to it November 9th and 10th. Going back and forth to record the song took me about three days because I had a certain amount of time each day to record as I was working around people's schedules. By November 15th the song was recorded and I already had in mind how I wanted most of the video to go. I knew I had to move quickly because I also wanted to release the video within the same month! The good thing about being a film major is that I have access to Howard University's equipment and access to classmates who are willing to help with projects. I assumed that mixing and mastering the track wouldn't take hardly any time and so I asked Moon, a producer, to mix and master the song. 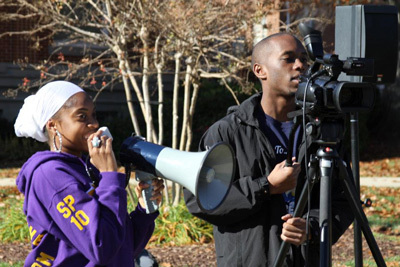 That Monday, November 13, I asked the tech center in the film department if I could use their speakers because I knew that in order to have great energy on the yard they would need to hear the music as loud as possible. My friend Tyrome made a flyer that said "Meet Me at the Yard" for Friday November 18 because I knew I wanted one of the scenes to depict campus life. 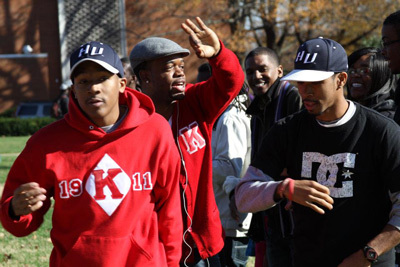 It turned out that that day was perfect because all of the fraternities were in their paraphernalia. Once I got it approved to shoot on the yard that Wednesday morning, which is a long story because at first they didn't approve of it, Tyrome finished the flyer and I dropped it on Facebook that night. The longest part of this process wasn't the music video but it was mixing and mastering the track. Moon was able to give me a mix that Thursday night, a day before the shoot, so that I at least had something to play for everyone on the yard and so I could record the video the rest of the weekend. However, we truly didn't finish mixing and mastering until the very day I dropped the music video, November 30. When you have a vision and you believe in it, trust that it will be done, because I didn't even have a camera team for the video until the day before we shot it but I knew that if I put everything in place that would come, because I know too many people who have that skill. I just made sure that I told my friends (the sisters walking with me in the park) when and where I wanted them to be on Sunday and what time and to wear bright colors. With this project everything was very time sensitive and there was no room for doubt. I put all my trust in God and worked very hard to prioritize and plan. If you organize your thoughts you can accomplish anything in the amount of time that you desire even if it appears chaotic; it's organized chaos. 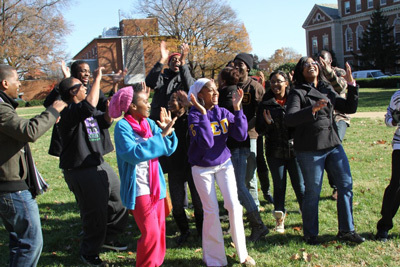 On Friday for the yard scene, the different fraternities were at their trees at 12pm (which is why I planned the shoot to be at that time) and so we asked them to be a part of the video. 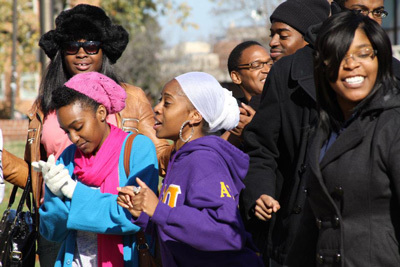 Believe it or not, it was hardest to convince the Omegas to participate. (Laughs) The photographer on set, Torrance Hill, who also agreed to film my close up shots in the pink outfit, went to the band room and got a lot of the students you see in the video. 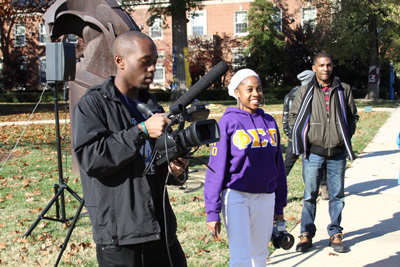 Torrence Roundtree was the man behind the camera for the yard scene and Sehiya Boyd was the camera woman for the yoga scene. Sister Nailah is a great friend and she wrote her verse in like 10 minutes and recorded it the same day because I had to leave for the studio immediately. She's that good. Shooting the video was the easiest part believe it or not. This project was 90% planning. BJ: It is filmed on a college campus but I don't see young girls half-naked and doing vulgar dance moves. Also, I see everyone having fun in a dignified manner. Why is that? What message are you trying to send with the lyrics and the way you coordinated this video? AM: I wanted this to show good wholesome fun. I want people to realize that you can have a great time without drugs, inappropriate behavior, or immodest attire. Real fun is when you're just loving life and being a natural beautiful you. There is not enough of that being portrayed in music videos these days. If you’re not popping bottles, throwing up money, or surrounded by half dressed women in your music video these days then you’re a rare case, but I enjoy being different and showing the world that it is okay to do so. BJ: You're a member of the Nation of Islam and being trained in the MGT-GCC Vanguard Class for women. How important is keeping your Islamic foundation intact as you pursue a career in the music industry? AM: Islam is my armor in this industry. Without my being trained as an MGT Vanguard, having a mother as an excellent example, and believing in the teachings of the Most Honorable Elijah Muhammad I would not be who I am today. Islam gives me the dignity and pride that makes me want to not only love, respect, and take care of myself as a young woman but to encourage other sisters to do the same. It is vital to keep my Islamic foundation intact because that’s the only thing that is keeping me sane in this time of mass confusion. It gives me peace now and I know my peace will be sustained while I'm in the industry because the music industry is extremely tough. Tough is actually an understatement. However, I refuse to compromise my faith because once that happens I will no longer be original, because too many people compromise. BJ: What is playing in your i-Pod as you walk the yard to class? AM: I actually don't have an i-Pod. (Laughs) But I listen to songs online and I used to download songs onto my phone. I enjoy reggae, classical, old school hip hop, 90's R&B, and gospel. BJ: I see the Internet is already buzzing over this video. What should your supporters look forward to from you in 2012? AM: In 2012, God willing, I will have my first album ready for y'all! I also want to have a few collabs. I would love to do a song with Lauryn Hill. I would also love to do a song with Kanye! Did I mention that I want a Grammy?! Time will tell what 2012 has in store. I'm always inspired to do something new so truly whatever comes to mind is what I will do! Thank you for the interview! BJ: Thank you! I'm proud of you niece. ASA. I LOVE MUCH SUCCESS AND BLESSING SIS.AKILAH! I LOVE THE SONG/VIDEO! PBTA!